Each year in Pennsylvania, more than 1,000 people are hurt and more than a dozen are killed in accidents involving bicycles and motor vehicles. In fact, 1,298 people were injured and 16 bicyclists died in these accidents in the state in 2016 alone, according to the Pennsylvania Department of Transportation. Many of these accidents are caused by distracted driving. Pennsylvania has a texting-while-driving ban that prohibits drivers from using an Interactive Wireless Communication Device (IWCD) to send, read, or write messages when their vehicles are in motion. 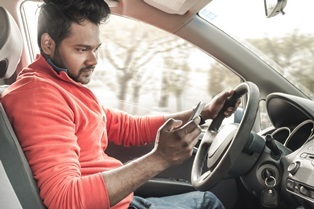 While texting is considered the most dangerous distracted driving behavior, any activity that takes a driver’s eyes away from the road, hands off the wheel, and attention from driving safely increases the chances of being involved in an accident and endangers others on the road. Bicyclists injured in accidents caused by distracted motorists may be entitled to compensation for medical expenses, lost wages, pain and suffering, and other damages. However, collecting a fair recovery from the driver or the insurance company requires proving fault. Being able to show the driver was distracted at the time of the crash can be extremely helpful. A knowledgeable personal injury accident attorney can speak to witnesses, request needed documents and interrogatories, arrange depositions, and other crucial aspects of evidence collection. If you were injured in a bicycle accident caused by a distracted driver, you may be unable to work and face an unexpected onslaught of accident-related expenses. That’s why it’s more important than ever to understand your rights. The skilled bicycle accident attorneys with the Accident and Injury Law Group can protect your rights, build a strong case, and explore every possible avenue for compensation. Contact the Accident and Injury Law Group today to schedule an appointment for a free initial case review.